Because elders cannot receive the fulness of the blessings of the priesthood without the sisters, it was thought the sisters, too, could benefit from these excerpts from a talk given at a training session of the General Authorities at general conference, April 1992. There are some things about the priesthood that every elder should know if he is to understand how the Church is governed to have things right before the Lord. There are principles and precepts and rules which are often overlooked and seldom taught. Some of these principles are found in the scriptures, others in the handbooks. Some of them are not found in either. They are found in the Church. You might call them traditions, but they are more than that. They are revelations which came when the Brethren of the past assembled themselves, agreed upon His word, and offered their prayers of faith. The Lord then showed them what to do. They received by revelation, “line upon line, precept upon precept,” true principles which form the priesthood way of doing things. (See Isa. 28:13; 2 Ne. 28:30; D&C 98:12.) These are things we do to have things right before the Lord. Priesthood is the authority and the power which God has granted to men on earth to act for Him. (See JST, Gen. 14:28–31.) When we exercise priesthood authority properly, we do what He would do if He were present. The Melchizedek Priesthood is also spoken of in the scriptures as the “greater priesthood” or the priesthood “which is after the holiest order of God” (D&C 84:18–19) and the priesthood “after the order of mine Only Begotten Son” (D&C 124:123; see also D&C 76:57). “Out of respect or reverence to the name of the Supreme Being, to avoid the too frequent repetition of his name, they, the church, in ancient days, called that priesthood after Melchizedek, or the Melchizedek Priesthood.” (D&C 107:4.) We can understand why that should be. The name of the priesthood is frequently talked about in meetings and lessons and is printed in handbooks and manuals. It would be irreverent to use informally the sacred title which includes the name of Deity. There are references to a patriarchal priesthood. The patriarchal order is not a third, separate priesthood. (See D&C 84:6–17; D&C 107:40–57.) Whatever relates to the patriarchal order is embraced in the Melchizedek Priesthood. “All other authorities or offices in the church are appendages to [the Melchizedek] priesthood.” (D&C 107:5.) The patriarchal order is a part of the Melchizedek Priesthood which enables endowed and worthy men to preside over their posterity in time and eternity. It is sometimes called the preparatory priesthood because it prepares one for the higher priesthood. The Levitical Priesthood (see Heb. 7:11; D&C 107:6, 10) is an order in or a part of the Aaronic Priesthood. Moses and Aaron belonged to the tribe of Levi. (See Ex. 2:1–2, 10; Ex. 4:14.) During the exodus from Egypt, the Levites were given priestly responsibilities concerning the tabernacle and always camped nearest to it. (See Num. 3:5–39.) While the Levitical order does not function today, its privileges and authority are embraced within the Aaronic Priesthood for whatever future use the Lord may direct. There are keys of the priesthood. While the word key has other meanings, like keys of wisdom or keys of knowledge, the keys of the priesthood are the right to preside and direct the affairs of the Church within a jurisdiction. All priesthood keys are within The Church of Jesus Christ of Latter-day Saints, and no keys exist outside the Church on earth. The President of the Church is the only person on earth who has the right to exercise all the keys in their fulness. (See D&C 132:7.) He receives authority by setting apart by the Twelve Apostles. Keys are conferred upon a man when he is set apart to be a president, such as a president of a stake, of a quorum, or as a bishop. Counselors do not receive keys. The priesthood is greater than any of its offices. When someone first receives the Aaronic or Melchizedek Priesthood, it is conferred upon them by the laying on of hands. After the priesthood has been conferred upon him, he is ordained to an office in the priesthood. All offices derive their authority from the priesthood. The priesthood is not divisible. An elder holds as much priesthood as an Apostle. (See D&C 20:38.) When a man receives the priesthood, he receives all of it. However, there are offices within the priesthood—divisions of authority and responsibility. One may exercise his priesthood according to the rights of the office to which he is ordained or set apart. Whoever holds the Melchizedek Priesthood or higher priesthood holds all of the authority of the Aaronic or lesser priesthood as well. While all who have had the Melchizedek Priesthood conferred upon them receive the full priesthood, sometimes one office is spoken of as being “higher than” or “lower than” another office. Rather than “higher” or “lower,” offices in the Melchizedek Priesthood represent different areas of service. There are different rights, privileges, and authorities which expand with each succeeding office. For instance, the offices of teacher or priest are spoken of as being higher than the office of deacon. A priest in the Aaronic Priesthood can perform any duty assigned to the teachers or deacons. For example, a priest may pass the sacrament, a duty usually assigned to deacons. A deacon, on the other hand, cannot bless the sacrament nor perform baptisms, duties which are assigned to priests. An elder can perform any duty assigned to any office in the Aaronic Priesthood, but he cannot do some things which belong to the office of high priest. These principles of priesthood government are established by revelation and do not change. In the dispensation of the fulness of times, the Lord instructed that the priesthood should be organized into quorums, meaning selected assemblies of brethren given authority that His business might be transacted and His work proceed. A quorum is a brotherhood. Except for the offices of bishop and patriarch, those ordained to offices in the priesthood are organized into quorums. Though one may be called to and released from ecclesiastical assignments for which one is set apart, membership in a quorum is a steady, sustaining citizenship. It becomes a right of one ordained to an office in the priesthood. And the holding of the priesthood, including the attendant membership in the quorum, is to be regarded as a sacred privilege. Each quorum is presided over by a president or a presidency. The Quorum of the Twelve is presided over by one president, the President of the Twelve (see D&C 124:127), as is the priests quorum presided over by the bishop (see D&C 107:87–88). The seventies quorums are presided over by seven presidents. (See D&C 107:93.) All other quorums are presided over by a presidency consisting of a president, a first counselor, and a second counselor. “And this is according to the oath and covenant which belongeth to the priesthood. There are two ways authority is conferred in the Church: by ordination and by setting apart. Offices in the priesthood—deacon, teacher, priest, elder, high priest, patriarch, seventy, and Apostle—always come by ordination. The keys of presidency and the authority to act in callings in the priesthood are received by setting apart. 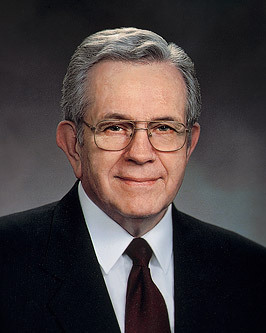 For instance, the office of elder in the Melchizedek Priesthood is an ordained office, but the office of president of an elders quorum is an office to which one is set apart rather than ordained. In either case, he is given a blessing to accompany his service in an office to which he is ordained or set apart. There are many “set apart” offices in the Church in both the priesthood and the auxiliary organizations. Some duties are inherent in the priesthood, and one need not be set apart to do them. Visiting the homes of members (home teaching) is an example. Because women are not ordained to the priesthood, when sisters are set apart to offices, including the office of president in an auxiliary, they receive authority, responsibility, and blessings connected with the office, but they do not receive keys. Ordinarily, the privileges connected with an ordination to the priesthood may be exercised anywhere in the Church. Priesthood holders need no prior authorization to perform ordinances or blessings that are not recorded on the records of the Church, such as consecrating oil, administering to the sick, and giving fathers’ blessings. The priesthood is always regulated by those who have the keys, and an ordinance must be authorized by the presiding authority who holds the proper keys and priesthood if the ordinance is to be recorded on the records of the Church. Authority connected to an office to which one is set apart has limits, including geographic ones. The authority of a man set apart as president of a stake is limited to the boundaries of that stake. He is not a stake president to members in a neighboring stake, nor is a bishop the bishop over members outside his ward. When a man is ordained a bishop, he is also set apart to preside in a specific ward and has no authority outside its boundaries. When he is released as bishop of that ward, he may still hold the ordained office of bishop, but he cannot function unless he is set apart again to preside over a ward. When a patriarch is ordained, he is set apart to give blessings to members of his own stake or to those who come into the boundaries of his stake with a recommend from proper authority from a stake where there is no patriarch. These principles of priesthood government are established by revelations. So that there may be order in advancement in the priesthood, a minimum age is set for receiving the priesthood and for ordination to each succeeding office within the priesthood. The Aaronic Priesthood is conferred upon a young man when he is ordained a deacon at age twelve or older. He then joins a quorum of up to twelve deacons. (See D&C 107:85.) When he is fourteen, he may be ordained to the office of teacher. He then joins a quorum of up to twenty-four teachers. (See D&C 107:86.) When he is sixteen, he may be ordained a priest. He then joins a quorum of up to forty-eight priests. (See D&C 107:87.) When he is eighteen or older, he may have the Melchizedek Priesthood conferred upon him and be ordained an elder. He then joins a quorum of up to ninety-six elders. The revelations state that “duty of the president over the office of elders is to preside over ninety-six elders, and to sit in council with them, and to teach them according to the covenants.” (D&C 107:89.) The high priests have no specific age and there is no specific number in a high priests quorum. High priests are organized into groups with group leaders. The stake presidency is the presidency of the high priests quorum in the stake. We do not call ourselves to offices in the Church. Rather we respond to the call of those who preside over us. It is the responsibility of those who preside to prayerfully consult the Lord as to His will concerning a position in the Church. Then the principle of revelation is at work. The call is then delivered by the presiding officer who is acting for the Lord. We do not, under ordinary circumstances, refuse a call. Neither do we ask for a release beyond calling to the attention of the presiding officer circumstances which may make a release advisable. When we refer to those who have been called to a presiding position by the title of their office such as bishop or president, it lends dignity to the office and reminds the one holding it of his sacred responsibility and it reminds us of our obligation to follow their counsel and respond to their calls. The Aaronic or Melchizedek priesthoods are not conferred, nor is one ordained or set apart to an office in either priesthood, unless he is willing to live the standards of worthiness. Those standards include moral purity, the payment of tithes, keeping the Word of Wisdom, and general standards of Christian conduct. Notice that there are two requirements: First, we must receive authority from someone who has it and has been ordained by the heads of the Church. Next, it must be known in the Church that he has the authority. The sustaining in the priesthood and the setting apart to office is done openly where it can be known to the Church who has authority, as the scriptures require. There is great safety to the Church in having the names of those called to offices in the Church presented in the proper meeting. (See D&C 20:65.) Anyone who is a pretender or a deceiver will be recognized. If someone claims to have been secretly ordained to a special calling or higher order of the priesthood, you may know immediately that the claim is false! The names of those to be ordained to the Melchizedek Priesthood or to another office in the Melchizedek Priesthood are presented in stake or district conferences. (A district in a mission is like a stake. A branch in a stake or district is like a ward.) The congregation is asked to approve the ordination by raising the right hand, or, if opposed to the ordination, they may signify by the same sign. This occurs in a stake meeting because the stake presidency presides over the Melchizedek Priesthood. In an emergency, for instance if a young man is leaving for a mission and has not been ordained an elder, the stake presidency should have his name presented for sustaining in his own ward sacrament meeting. The ordination is then presented for ratification at the first appropriate stake meeting. Only in an emergency would this process be followed; otherwise it is not in order. Advancements in the Aaronic Priesthood are sustained in ward meetings because the bishopric presides over the Aaronic Priesthood. Members called to positions in the auxiliary organizations are also sustained before being set apart in the appropriate stake or ward meeting. The bishop, as the common judge, presides over all members of his ward, including holders of the Melchizedek Priesthood. (See D&C 107:74.) All members pay tithing to the bishop and should seek counsel from him. The bishop must be a high priest (see D&C 68:19; D&C 84:29; D&C 107:17, 69–73) and is designated as the presiding high priest in the ward. In this capacity he may preside over the ward council and ward priesthood executive council meetings, where elders quorum and high priests group officers are in attendance. While the bishop may recommend that a man be ordained an elder or high priest, and verify his worthiness, the approval and ordination are under the direction of the stake presidency. A bishop does not call, nor can he release the presidency of an elders quorum; they come under the direction of the stake presidency. A bishop might convene a disciplinary council to consider the transgression of an elder in his ward. He may disfellowship the elder if that is merited, but he cannot deprive him of his priesthood by excommunication. That would require a disciplinary council presided over by the stake presidency, who govern the Melchizedek Priesthood. The bishop has authority to judge the worthiness of a member to receive a temple recommend, and his counselors have the authority to assist in interviewing ward members for subsequent temple recommends. The stake president or his counselors also interview those going to the temple, because there members will participate in ordinances of the Melchizedek Priesthood. Sometimes a man may hold more than one ordained office at a time. For instance, both bishops and patriarchs are also high priests. Also, a man may hold an ordained office and be set apart to other offices. For instance, an ordained elder may be set apart to offices such as president of his quorum, a ward mission leader, or Sunday School president. The Lord counseled us to “let every man learn his duty, and to act in the office in which he is appointed, in all diligence.” (D&C 107:99.) An elder who has been called to an office of presidency should respect the callings of those over whom he presides. He should let, indeed help, them do that which they are called to do without usurping their responsibilities. In turn, holders of the priesthood should avoid going around their file leader to a higher authority supposing that they will receive better counsel, more wisdom, spirituality, or authority. It is better to respect the callings of those over whom we preside and of those who preside over us. Sometimes there must be exceptions to the rules and principles by which the priesthood is governed. Care must be taken to see that everything having to do with ordinations and settings apart are done in proper order. Generally, exceptions are approved by the First Presidency of the Church. The Melchizedek Priesthood “administereth the gospel and holdeth the key of the mysteries of the kingdom, even the key of the knowledge of God. “Therefore, in the ordinances thereof, the power of godliness is manifest. “For whoso is faithful unto the obtaining these two priesthoods of which I have spoken, and the magnifying their callings, are sanctified by the Spirit unto the renewing of their bodies.